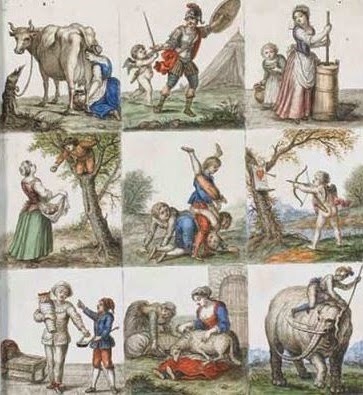 Rodama: a blog of 18th century & Revolutionary French trivia: Cavagnole - a "cheating game"
[They believe that the game amuses / but boredom arrives, step by step/ at the cavagnole table / to take a seat between their Majesties]. How did you play cavagnole? Casanova describes a occasion when he played biribissi - a "cheating game" - in Genoa and spectacularly broke the bank, carrying off not only all the takings, but the table cloth, biribissi board and four silver candlesticks! Cavagnole differed from biribi in that it used sets of cards distributed among the players rather than a single board. It also dispensed with the gamesters; players simply drew lots and took it in turn to act as banker. 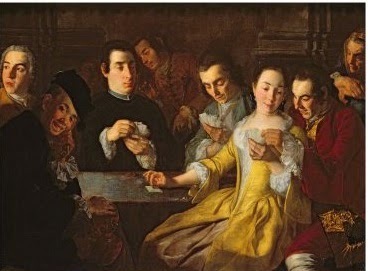 In the late 1730s the game became all the rage among the ladies of Versailles, Queen Marie Leszczyńska being a particular enthusiast. (Voltaire complained that "lèse-cavagnole" had become"lèse-Majesté") The duchesse du Maine also played avidly at her gatherings in Sceaux. The duc de Luynes in his Memoirs for June 1737 refers to cavayole (sic) as a game which had recently appeared, said to have come from Italy. He describes the rules very clearly. It is, he says, a type of biribi in which the board (tableau) is divided into six, eight or even ten cards of twelve sections. There are as many balls as there are numbers. Each player bets a maximum of 22 tokens ("jetons"). If a player has all 22 tokens on the winning number, each of the other players pays out 22 tokens and one besides. If the number of tokens is fewer, then that amount is paid out by each player, always with one extra. One is also paid for a square with no tokens at all on it. Each player draws six balls. None of the surviving sets of cavagnole quite correspond to the duc de Luynes's game. 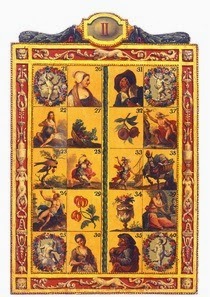 The Cooper Hewitt museum has a example with twelve cards, each of twenty squares. Instead of the bag, this set dispenses game pieces from a "cup" - a scoop-shaped gilded and decorated bowl with a long handle. 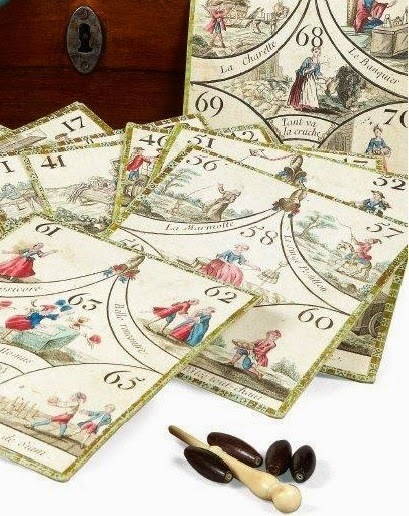 The example in the Musée des Arts Décoratifs, manufactured by Aufrère, rue Planche Mibrai, in around 1780 is more typical and probably represents the later, standardised version of the game. It has 24 cards, each with five numbers - one in each corner and one in the middle. Apparently bets could be placed on the whole card, covering two numbers "à cheval", or on a single number. 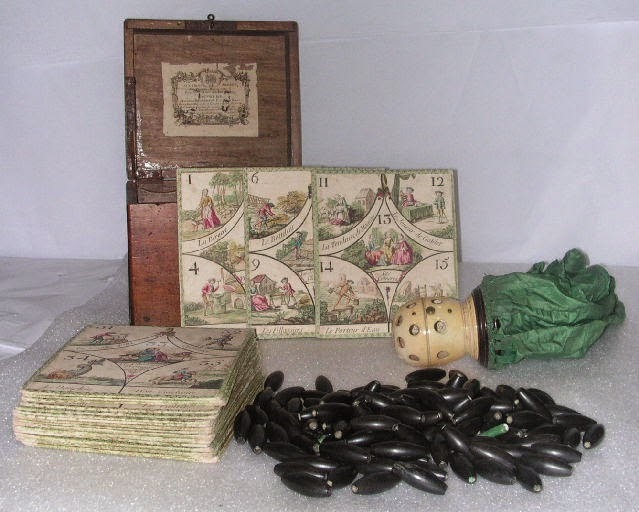 The cards are extensively decorated with scenes of everyday life - trades, entertainments, musicians - no doubt to lend interest to the wager. Elaborate measures were provided to exclude foul play. The numbers were printed on tiny parchment scrolls which fitted into little wooden beads or "olives" which were then placed in the green silk drawstring bag. An ivory cap allowed only one bead to be drawn at a time. A virtually identical set, sold at auction in Paris in December 2012 still had the pointed ivory pin used to extract the scrolls from the beads. Nowadays cavagnole cards are prized for their design:. 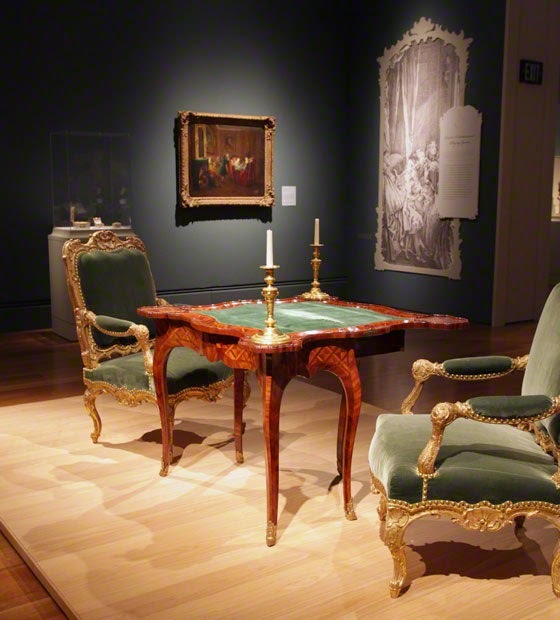 See also, the exhibition"Jeux de princes, jeux de vilains"
Paris gamblers: gaming in 18th century France (Getty Iris): Cavagnole set. Private collection. 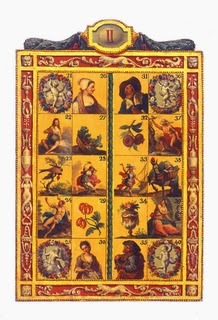 With 160 numbers and green "olives"
Collection des jeux anciens [blog]: "Le jeu de cavagnole" - Example with fifty cards. There is a passion, very unreasonable in the eyes of philosophers and of reason, the motive of which, however disguised it may be, is even humiliating, and should be enough to cure one of it and which, nevertheless can make one happy: it is the passion of gambling. It is a good passion to have, if it can be moderated and kept for the time in our life when this resource will be necessary to us, and this time is old age. There is no doubt that the love of gambling has its source in the love of money; there is no individual for whom playing for high stakes is not an interesting activity (and I call high stakes gambling that can make a difference to our fortune). Our soul wants to be moved by the passions of hope or fear; it is made happy only by things that cause it to feel alive. Now gambling places us perpetually in the grip of these two passions, and consequently holds our soul in an emotion that is one of the great principles of happiness to be found in us. The pleasure that gambling has give me has often served to console me for not being rich. I believe I have had a good enough mind to be happy with what would seem to others a mediocre fortune; and in that case - if I were rich - gambling would become dull for me. At least I was afraid that it would, and this fear of boredom convinced me that I owe the pleasure of gambling to my limited fortune, and that consoled me for not being rich. The amusement provided until time for the supper was a biribissi, to which the women in particular were passionately addicted. The game was forbidden in Genoa but people were free in their own houses, and the government could say nothing. So the gamesters who owned and operated the game went to the private houses to which they were summoned, and word was sent to the players, who assembled there. That evening, unfortunately for them, the gamesters were at Signora Isolabella's, and so she had a large party. To do as the others were doing I began playing too. In the room in which were were playing there was a portrait of the Signora dressed as a Harlequiness, and on the biribissi board there was a Harlequiness; to pay my court to the mistress of the house, beside whom I was seated, I staked a zecchino on the Harlequiness.The board contained thirty-six figures, the winner was paid thirty-two times his stake. Each player in turn drew a ball from the bag three times in succession. The biribissi gamesters numbered three: one tended the bag, another kept the money, the third attended to the board, gathering in the money staked on the various figures as soon as the ball had been drawn. The bank amounted to some two thousand zecchini. The table, a handsome cloth, and four silver candelabra belonged to the gamesters. One could stake as much as one wanted on a number. I staked a zecchino each time. Signora Isolabella having been the first to draw, and the bag going round to her right, my turn did not come until last. As fifteen or sixteen people were playing, when my turn arrived i was behind by almost fifty zecchini, for the Harlequiness had never come out. Everyone condoled with me. History of My life, vol. 9 (1997) p.123. One plays Biribi with 70 numbers, each punter puts a certain sum on the number that he chooses; the banker draws next a number, pays to those who have chosen the drawn number, 63 times their stake, and all those of the punters belong to him. We suppose therefore that a punter has staked a piece on a given number; since there are 70 numbers, the probability that this number will arrive is 1 70 ; that it will not arrive is 69 70 . In the first case, the punter will receive 63 pieces, and having given one of them, will win 62: in the second, he will lose the piece which he has given. His expectation will be therefore (article V.) 1 70 × 62 − 69 70 × 1, or − 7 70 , this is − 1 10 . The expectation of the banker will be on the contrary 69 70 1 − 1 70 62 = 1 10 . If one supposes that the punters were in any number, they are able, at each trial, to put indifferently on such numbers as they have wished, any sum, but contained in some certain limits, the expectation of the banker will be equal to 1 10 of the mean value of that which the punters will have been able to risk, and consequently 1 620 of all the sum that the banker is able to lose. But it follows equally from the established principles in the preceding article, that the probability for the banker to have a gain which approaches the value of that mean expectation, is able to begin to be great only by supposing that he plays a rather great number of trials. It is necessary therefore, in order to calculate with exactitude the lot of the banker, when he is determined to play this game, to evaluate first the number of trials that he must naturally play, to see next what sum he must possess in order to have a very great probability that he will not be forced to quit the game, that he will not be bankrupted; to regard then that sum as a fund that he exposes in a commerce accompanied with risks, and to seek the probability that he will not lose at all a considerable part of this funds, that he will conserve it complete, that he will win a sum which has one such ratio with that total sum. If one is able to suppose that the banker has more considerable funds, and if he is proposed to make this business a nearly known number of times, during one year, it is necessary to know his advantage, to see (the funds that he must have made being given also) what probability he will have to not encroach upon his funds, and to draw from them on the contrary a certain rate of interest. One will see by this means what are the true advantages and the risks of this commerce, compared with those of the other kinds of commerce; and one will judge if this advantage of 1 10 at each trial is above or below the one which it was reasonable to accord to him. To this first observation it is necessary to join another. In the games of this kind the conduct of the punters has on the advantages of the banker and on their proper risks, an influence which is necessary to evaluate. We suppose, in fact, that each punter is able to put at will on a number from one piece to thirty-two, and that he chooses the resolution to increase his stake successively, in a manner that, as soon as a number exits to him, there is a profit for him, or at least that he experiences no loss. This combination changes much the state of the game. It is clear, in fact, 1 ◦ that it embraces 254 trials; 2 ◦ that the punter, instead of a greater probability of loss, will have on the contrary a probability to win greater than 937 38 ; 3 ◦ that the banker, instead of a great probability to win and a small risk to lose much, will have a very small probability to win much, and a great probability to lose little; 4 ◦ that the mean value of the gain of the banker or of the loss of the punter will be, not the tenth part of that which the punter has been able to risk, but a much more feeble sum, while on the contrary, instead of being the 1 620 part of that which the banker has risked, it will be much higher; but also the stake of the punter will be much greater, and the sum risked by the banker much smaller. One sees here that it is necessary to fix a limit to the stakes. In fact, in the example that we choose here, and where it is from 1 to 32, the probability to win that the banker has, is only 1 38 , for each of these combinations of trials, that one is able to regard as one alone. If one had supposed a latitude greater in the stakes, it would have been much smaller. For example, for a latitude from 1 to 127, the banker would have more than a probability to win of around 1 133 ; it is true that he would not lose beyond 62, and that the punter, at the end of 340 trials, which contains this combination, would have been able to lose to 7989 times his stake. On another side the gain of the banker is able to arrive only after 340 trials. But all the punters do not follow this method; on the contrary, the greater part play at random, nearly always after some superstitious ideas which they attach to certain numbers. Some diminish their game, when they lose, because they believe in bad luck; others increase it in order to recoup earlier. It is necessary therefore, in calculating the advantage of the banker, to have regard to the conduct of the players, and to see if, even in supposing that they follow the particular combination that we just exposed, the banker will have sufficient advantage. Now, it is easy to sense that that is not able to happen, at least that the limits of the stakes are such only the banker has, in the space of some sessions, a rather great probability to win, even against those who follow this manner of playing. This example, taken from the simplest game among the games of this kind, where the banker has an advantage, proves that it suffices not at all, in order to calculate it, to take the mean value of the expectation, such as an abstract consideration of the game would be able to give. We terminate this first example with the discussion of two questions. 1 ◦ Does a punter find a real advantage to choose the combination which we have exposed and which procures to him a great probability to win? I believe that one must respond negatively. In fact, he acquires this probability only for the gain of a small sum, and he risks to lose a very considerable sum in a game disadvantageous to himself. Also the punters must consider the game only as a diversion which they pay; and the manner to calculate their state would consist in examining if, without being exposed to make a ruinous loss, they have in the games of this kind, a sufficient probability to not pay too dear the pleasure that the game procures to them. The only prudent conduct for them is to fix, according to their fortune, a sum above which they themselves would determine to never lose in a session and to reserve themselves, when chance favors them, a part of the gain which they have made. By this means, they will have a mean value of their expectation, always negative, I admit, but much below the tenth part of their total stake, and would be able to conserve, for a long space of time, a probability to win greater than that to lose, as they have in biribi, from the 48th trial to the 63rd . One is able to demand 2 ◦ if, in the case where one makes the combination which we have exposed, that which is called make the martingale, must one continue to put on the same number, until it exits, or to put at random at each trial, on any number whatsoever, even on the one which just exited? The calculus, contrary to the former in common opinion and even to natural sentiment, responds that nothing is more indifferent. Whatever be in fact the preceding events, the calculus will give always here 1 70 for the probability of each number. The common opinion appears based only on natural sentiment, and this sentiment has only a single cause, it is that one is more struck to see in biribi, for example, the number 3 to exit twice in sequence, than to see the numbers 2 and 10 to exit one after the other. One of these events strikes us as remarkable; the other is not perceived. Now, these events as one remarks, are less numerous than the others; one is therefore carried to regard them as extraordinary. One does not make a reflection that, if, in 70 · 70 or 4900 possible combinations of two trials of biribi, there are only 70 combinations which give the same number repeated twice and 4830 which give two different numbers, the combination 3 and 3 is unique among the 70 combinations of the first class, and the combination 3 and 10 among the 4830 of the second, so that, if the probabilities to have a combination of the second class, or one of the first, are 4830 /4900, 70 /4900 or 69 /70 and 1/ 70 ; that to have next a determined event of the second, being 1 4830 and a determined event of the first 1 70 , the real probability of a determined event will be therefore, for one of the classes, 4830 /4900 1 /4830 or 1/ 4900 and for the other, 1 70 · 1 70 = 1 4900 : these two probabilities are therefore equals. If this manner to play gives a probability to win at the end of a certain number of trials, it is not that after having lost 253 times, for example, one has a probability greater than 1/ 70 to win the 254; it remains always the same at each trial, and the probability 37 38 to not lose, has place only for the one who is determined to follow this combination at the beginning of the game, and after having knowledge of the events which precede this last trial; because from the moment where the events are known, for example, if he has lost 253 trials in sequence, he has for the 254th a probability 1 /70 to win 18 times the first stake, and a probability 69 /70 to lose 1998 times this same stake.